No magnitude 5+ Quakes reported today. A new study estimates that more than 600,000 bats are killed each year by the rotation of wind turbines in the continental United States. Wildlife experts say those deaths are in addition to the large numbers of the flying mammals that are being killed by white-nose syndrome, which is caused by a fungus that has spread rapidly to bat caves and mines across North America. 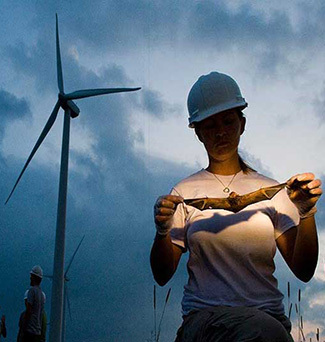 Writing in the journal BioScience, University of Colorado researcher Mark Hays notes that the actual number of bat deaths from the turbines could be much higher than the conservative estimate of 600,000. The majority of bat species produce only one young per year, meaning that their populations are slow to recover. Most bats don’t die from actual contact with the turbines since their sonar allows them to avoid the blades. But subtle changes in barometric pressure created by the rotating blades cause the bats’ capillaries to burst, resulting in deadly internal hemorrhaging. Most bat deaths occur when winds are relatively light because bats can’t fly in high winds. And since most turbines shut down when winds go below about 9 mph anyway, experts say increasing the “cut-in speed” to 11 mph would reduce bat deaths by at least 44 percent. As much as 93 percent of bat fatalities due to turbine barotrauma could be avoided if the cut-in speed was lifted to 15.6 mph, experts say. A young woman in Taiwan has contracted a new strain of influenza A, which is very similar in structure to the H7N9 bird flu that killed 45 people and infected 139 other in China last year. The H6N1 strain is believed to have come from infected poultry and reacts to the same drugs that combat other strains of bird flu, like Tamiflu and Relenza, according to Taiwan’s Centres for Disease Control. Researchers there say H6N1 is widespread in poultry but no reported cases of transmission to humans have been found. The Taiwanese patient fully recovered, and no trace of the virus was found in the 36 people with whom the woman had close contact. Etna (Sicily, Italy): The New SE crater has calmed down. Only very occasionally, a weak glow appeared from the summit vent at night, suggesting deep-seated activity still occurs from time to time. Klyuchevskoy (Kamchatka): Activity has generally decreased over the past days. VAAC Tokyo reported a possible eruption early today, producing a small ash plume rising to 17,000 ft (5.1 km), i.e. a few hundred meters tall. Webcam images at that time are cloudy, but otherwise show the volcano is mostly quiet. Sakurajima (Kyushu, Japan): Activity seems to increase and decrease in cycles of approximately a week’s length. After the series of stronger explosions on 24-25 Nov, the past days have been calmer with fewer and less intense explosions (1-2 per day, ash plumes to 8,000 ft). Sinabung (Sumatra, Indonesia): Visual activity has decreased. Ash emissions have become less intense and less frequent. However, this could be only a pause, and the risk of larger explosions that can occur unexpectedly remains high. Dukono (Halmahera): A dense SO2 plume is visible on the latest NOAA satellite data, suggesting that (the ongoing) activity (weak to moderate strombolian explosions) is elevated at the moment. Popocatépetl (Central Mexico): CENAPRED reports no changes in activity. The number of explosive emissions of gas/steam and minor amounts of ash is very low (less than 10 per day). Weak glow remains visible at night and SO2 emissions elevated. A volcano-tectonic quake of magnitude 2.2 was recorded yesterday at 04:33 local time. Santa María / Santiaguito (Guatemala): Activity has been mainly effusive during the past days; no or few explosions occurred yesterday. The volcano observatory reports abundant avalanches from the active lava flows mainly on the NE side of the Caliente lava dome. Pacaya (Guatemala): INSIVUMEH reports continuing weak strombolian activity. Small ash plumes at altitudes of 2.5-2.7 km drift up to approx. 10 km mainly to the SE. Fuego (Guatemala): No significant changes in activity have occurred. The volcano produces small to moderate strombolian-type explosions with ash plumes rising up to about 800 m. The lava flows are no longer active. 5.6 Earthquake hits southern Iran. 5.5 Earthquake hits the Anatahan region, North Mariana Islands. 5.1 Earthquake hits Arunachal Pradesh, India. 5.0 Earthquake hits neat the east coast of Honshu, Japan. 5.0 Earthquake hits the Indian Ocean Triple Junction. There are no active storms or areas of interest in the eastern Pacific or the Atlantic. The 2013 Atlantic hurricane season comes to a close on 30 November and was the least active season so far this century, and among the quietest on record since 1950. On 27 November, 2013, the National IHR Focal Point of Qatar notified WHO that the Supreme Council for Health and the Ministry of Environment, in collaboration with the National Institute of Public Health and Environment (RIVM) of the Ministry of Health and the Erasmus Medical Centre in the Netherlands, have detected Middle East Respiratory Syndrome coronavirus (MERS-CoV) in a herd of camels in a barn linked to two confirmed human infections infections. Call it a cosmic holiday miracle. The much-anticipated Comet ISON appeared to disintegrate during its Thanksgiving Day slingshot around the sun Thursday, but something — it seems — may have survived. 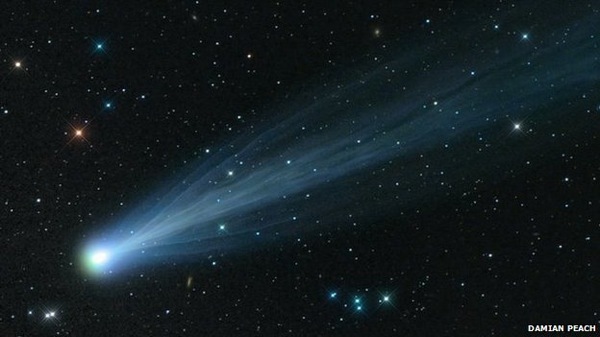 A NASA update released early Friday (Nov. 29) confirmed the sighting of what appears to be Comet ISON. The question remains whether it is merely debris from the comet, or if some portion of the comet’s nucleus survived, but late-night analysis from scientists with NASA’s Comet ISON Observing Campaign suggest that there is at least a small nucleus intact. Etna (Sicily, Italy): Although the paroxysmal phase of the eruption ended at night, tremor has remained elevated and strombolian explosions continue to occur from the summit vent of the NSEC. 5.1 Earthquake hits the Indian Ocean Triple Junction. 5.0 Earthquake hits Yunnan, China. 5.0 Earthquake hits the Mid-Indian ridge. Tropical cyclone Lehar is located approximately 215 nm east-northeast of Chennai, India. The very severe cyclonic storm Lehar weakened to a cyclonic storm Wednesday, as wind speed fell to 90 kmph from 180 kmph, hours before landfall expected on Thursday. It changed direction and may now make landfall as a cyclonic storm between Machilipatnam and Nellore, India. Winter storm Boreas – Heavy snow piled up Wednesday in parts of the Northeast and Appalachians while rain drenched locations closer to the coast as a winter storm disrupted millions of travellers heading out for Thanksgiving. Nationwide, nearly 475 flights had been canceled and more than 3,600 had been delayed as of late afternoon. Some of the worst delays were at Philadelphia and the three New York City area airports. Although the storm will be long gone by Thursday morning, howling winds in its wake could spell trouble for some of the big balloons at the Macy’s Thanksgiving Parade in New York City. Snow fell in the Appalachians and portions of the interior Northeast. Snow was reported falling as far south as Atlanta. The city picked up 0.4 inch of snow, which was only the third time measurable snow fell there in November since 1930. Winter storm warnings and winter weather advisories remained in effect as of late afternoon Wednesday in the central and southern Appalachians, portions of northeast Ohio and northwest Pennsylvania, upstate New York and northern Maine. More lake-effect snow was forecast to fly on Thursday around the Great Lakes. Flood watches also remained in effect for drenched eastern portions of the Northeast. Earlier Wednesday, the weather service confirmed that an EF-2 tornado hit Atlantic Beach, North Carolina, injuring two people. This was the same storm that blitzed the Southwest earlier in the week, killing at least 12 people in traffic accidents. More than 43 million people were expected to travel over the long holiday weekend. A landslide at an open pit coal mine in north China’s Shanxi Province has claimed lives of at least three people and buried four others. Rainfall swept across Trinidad for most of yesterday, causing floods in Monkey Town, Barrackpore, Ste Madeleine, Debe, Penal, Otaheite and Cross Crossing. Two people suffered minor injuries when the roof blew off their condominium in Atlantic Beach along the North Carolina coast in what the National Weather Service confirmed Wednesday as a tornado. Comet Ison came from the Oort Cloud, a mysterious, icy region at the furthest reaches of our Solar System. It has been hurtling towards the Earth, travelling at more than a million kilometres an hour. Now it is entering the most perilous stage of its epic journey. It will pass the Sun at a distance of just 1.2 million km, effectively grazing its surface. It will be getting exposed to more and more intense solar heat, and that will start to sublimate the ices (turning them into gas) at an increasing rate. The Sun’s intense gravitational field produces tidal forces that will also have a major effect on the comet. Scientists fear it could follow the path of Comet Lovejoy, which broke apart after it passed near the Sun in 2011. Or it could run out of fuel and fizzle out. It is hoped Ison’s large size could protect it. Etna (Sicily, Italy): No significant changes have occurred. The New SE crater remains restless with some occasional weak activity, visible from time to time as faint glow on the webcam at night. Tremor is currently low. Suwanose-jima (Ryukyu Islands): Explosive activity has resumed at the remote volcano in the Tokara Island chain. VAAC Tokyo reported explosions yesterday and this morning, with ash plumes rising to 4,000-6,000 ft (1.2-1.8 km) altitude. Weak 2013 Atlantic hurricane season draws to close November 30th. Tropical cyclone Lehar is located approximately 390 nm southeast of Visakhapatnam, India. Dangerous Category 1 Cyclone Lehar is slowly intensifying as it heads west-northwest at 10 mph towards India’s Bay of Bengal coast. Lehar has not been able to form a prominent eye, and is likely having problems getting organized in the face of moderate wind shear. Ocean temperatures are a very warm 28 – 29°C, and Lehar should be able to attain Category 2 strength before landfall Thursday. Cooler waters near shore and an increase in wind shear as the storm nears landfall will likely mean that Lehar will be weakening as it comes ashore.